My phone “talks” to my desktop computer. It can also “speak” with other devices with which it is “paired” (portable speakers, my lawn mower and my house security system). Coupled devices send and receive short-wavelength UHF radio waves in the ISM band (Bluetooth) to communicate. They follow rules (a vocabulary and a grammar) which specify the “meaning” of the bursts of radio waves they send and detect. I cannot detect any of these signals with my senses. I am neither aware of the communication taking place nor can I enter the conversation except through a compatible device within my control and with which I can communicate using a system which is within the range of my sensory capabilities (touch, vision, sound). Does the system of signals being used by the bluetooth devices for their communications constitute a language? There is a vast discourse, starting from ancient times, on the definition and the purpose and the philosophy of language. The Encyclopedia Britannica puts it thus. I find it is not necessary to specify that language is confined to human brains. It is claimed that the difference between human and animal communication is that human language is unrestricted. EB again – “Human beings are unrestricted in what they can communicate; no area of experience is accepted as necessarily incommunicable, though it may be necessary to adapt one’s language in order to cope with new discoveries or new modes of thought. Animal communication systems are by contrast very tightly circumscribed in what may be communicated”. But this is unsatisfactory. Human thought is not in fact unlimited. It is limited by the very finite capability of the human brain. What a brain cannot perceive it cannot think about. What it cannot think about, it cannot communicate. Furthermore, the system agreed-upon restricts the meanings that can be transmitted and received. (A communication in French is of limited value to someone who knows little French. It is the lowest common level of shared encoding in the system which sets the constraint). I also find the debate on language and thought, and language and philosophy, to be very often circular. It may be simplistic but I observe that the logic we perceive to exist in the universe is the same logic we embed in all our languages (including mathematics). We cannot then use language to prove or disprove the logic that is within it. Which I paraphrase to be that “in a language embedded with a logic, that language can neither prove or disprove the logic that lies within it”. I observe that we have more thoughts and emotions and perceptions than we have language for. We perceive more colours than any language we invent can describe. Which convinces me that thought precedes language. Moreover, it is the logic we perceive around us that we then build into the languages we invent. It cannot be, I think, that language circumscribes thought. It is our thoughts generated by our perceptions of what is around us that circumscribes the languages we invent. Our senses come into play first in determining the meanings we wish to communicate. They then determine the shared system of encoding meanings into signals capable of being generated and detected. Our perception of a tree (vision/brain) is encoded into a particular sound (“tree”) which is generated (vocal chords) and detected and decoded by somebody else (aural/brain) and understood – according to the shared system of encoding – to mean a tree. The choice of encoding system is arbitrary but is primarily a matter of convenience. We use vision, sound and touch as a matter of convenience. We do not use olfactory signals because we cannot – at will – generate as great a range of smells as of sound. Besides, vision and sound can transmit signals across much greater distances than smells can. Sound can be transmitted in the dark. We do not have the capability in our bodies of generating or detecting radio waves or X-rays or infra-red radiation as encoded signals of meaning except through the use of specialised, instruments manufactured for the purpose. But if we had the same organs as bats do, we could use ultrasound signals in our languages. Our senses enable a convenient encoding of meanings into signals. Equally the limitations of our senses restrict the range of signals that we can generate and/or detect. So my bluetooth devices do communicate with each other but the range of meanings they can transmit or receive are heavily circumscribed. They have not the freedom to express meanings which have not been predefined. They cannot initiate a conversation but can follow an instruction to do so. They do not have language. But what is clear is that while language is a shared. 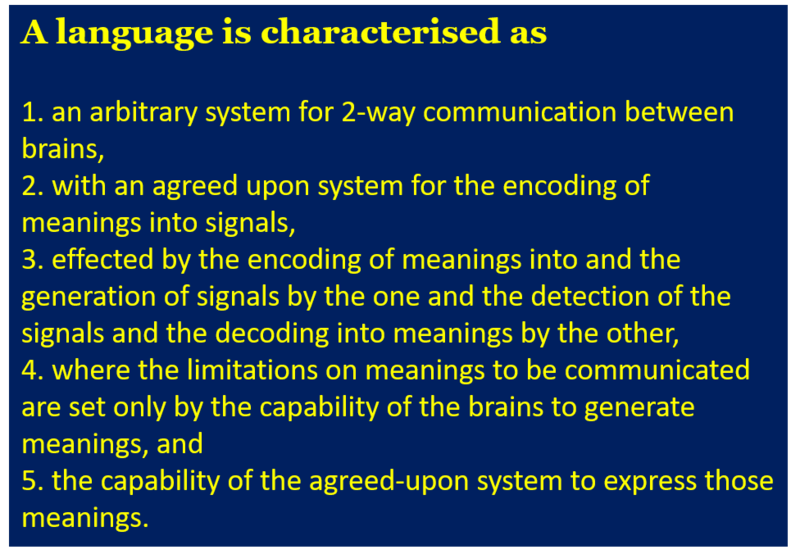 agreed-upon system for encoding meanings into signals for the purpose of communication, language transcends its signals. While human language is mainly manifested as speech and writing, we also use sign-language and Braille and songs and music and art and dance within our languages. Photography and video are now part of the encoding we use in our languages. If we had organs for radio transmission and reception, we would no doubt have a word for “tree” but it would be expressed as a burst of radio-waves rather than a pressure wave or an image of a tree. Language is the system of conveying meanings where speech and writing and hand-signals are just specific forms of encoding. Language is a system which transcends the encoded signals it uses. This entry was posted on July 19, 2018 at 10:32 am and is filed under Language, Philosophy. You can follow any responses to this entry through the RSS 2.0 feed. Both comments and pings are currently closed.